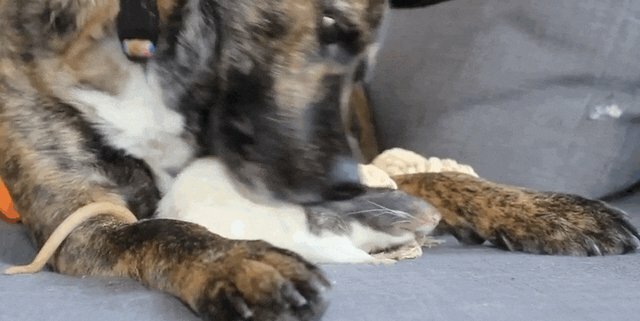 Osiris the dog and Riff Ratt the rat have been inseparable for quite some time. The dog is around 4 years old, and is a rescue Dutch shepherd. "Osiris was found in a parking lot in Detroit as a tiny puppy on Thanksgiving weekend a few years ago, and I was asked to foster him for the weekend," Mickey Alice Kwapis, Osiris's mom, told The Dodo. "Needless to say, I fell in love and we decided to keep him forever." Riff is around 1 year old, and the pair live in Chicago with their mom, other rat brother, and a cat. They do pretty much everything together, and make quite the crew. Their other rat brother is named Milhouse. Normally Osiris and Riff are the main cuddle buddies, but when the three of them hang out together, Osiris has to figure out how to divvy up the attention. They say three's a crowd, but that definitely doesn't seem to be the case with these guys. 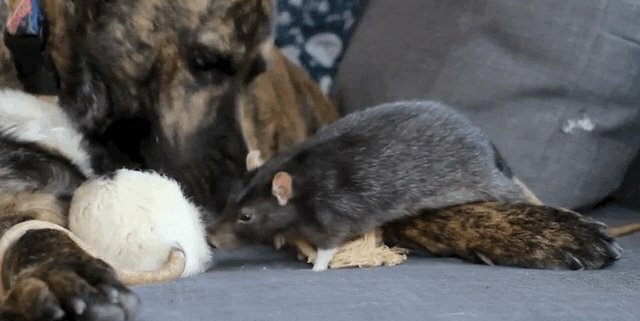 Osiris is so gentle with his little rat friends, and loves to lick and cuddle them. Even though Osiris and Riff are very close, they seem more than happy to have Milhouse join their cuddle puddle too. After all, the more the merrier!